When I first started working with children, learning to use a mouse was a challenge because students did not have computers at home. Now, many of my students have touch screen devices, and have no idea how to use this tool. Thumb and ring-finger rest on the sides of the mouse. Index and middle finger rest on top of the large buttons. Make sure that the wrist and arm are straight and in a comfortable position. Below are some of my favorite resources for learning how to use a mouse properly. My computer mouse: Educational song and video about the mouse. From British Council Learn English Kids site. Click the Mouse: Kid friendly song that shares how a mouse works. Spider Move mouse around the screen to play a game of chase. I See You! : Eyes watch as cursor moves. ABCya! Flappy Dragon: Students click to help the dragon fly through obstacles (similar to Flappy Bird). ABCya! Make a House - Children's Activity Build a house by clicking, selecting, dragging/dropping. Bubble Letters Set up the game by choosing the letters on which to focus. Bubbles appear with the letters (lower and uppercase), voice says the letter and directs to pop, on pop says the sound. Flower Garden: Click, double click, drag/drop to create a virtual flower garden. Hide n' Seek with Zoomer: Click to locate hiding cat in a small scene. Mouse Concentration: Mouse matching game on author Jan Brett's site. Mousercise: Series of simple computer mouse games that allow students to practice precision movement and clicking on screen objects. Tidy the Classroom: Students, click, double click, and drag/drop to straighten a classroom. Feed the Monster: Drag and drop food to feed the monster. FireFlies: Catch fireflies, drop in jars, addition problem shows how many fireflies in total have been caught. Mouse Practice Matching: Drag and drop to match colors. As an extension of the drag and drop movement, also considering drawing tools, such as Microsoft Paint, Tux Paint, or Canvastic. Mousing Practice: Same Game: Double click to remove matching letters. MouseProgram.Com - Double Clicking: Double click to move the squirrel. MouseProgram.com Right Click: Right-click to move the squirrel. How to Use the Mouse: Video tutorial published by YPI EdTech. Mouse Tutorial : Interactive tutorial from New Jersey's Burlington Country Library. 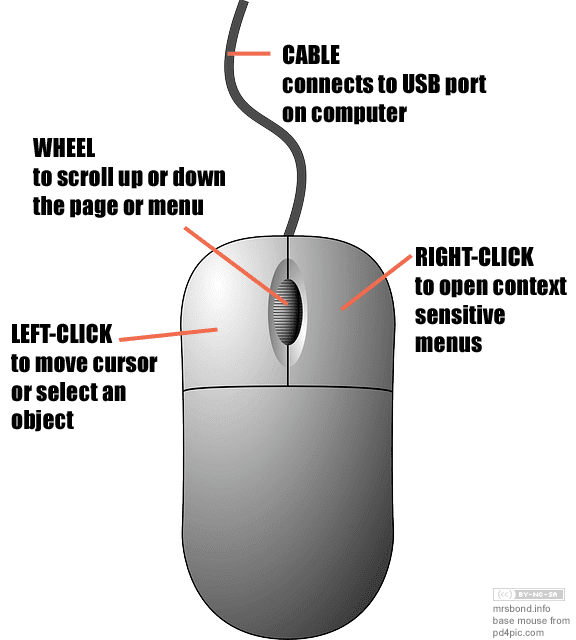 Mouse Tutorial Step by step interactive tutorial on what a mouse is and how it can be used. Includes hyperlinks. From Rome Library. Mouse Exercises: Designed for senior citizens, focuses on basic mouse skills. From SeniorNet.org.